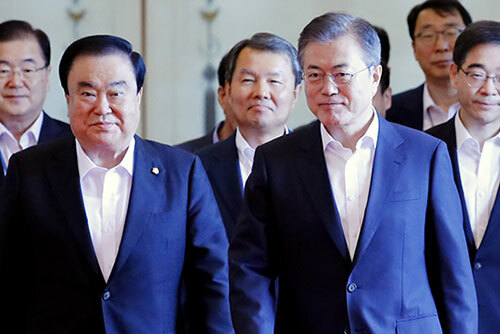 President Moon Jae-in said Friday that though the country's constitutional institutions have accumulated expertise and experience over their long history, he believes they still fall short of public expectations. He gave this opinion during a lunch meeting held at the top office with five national leaders. The meeting’s participants, along with Moon, are the six highest national leaders under the Constitution. Moon said the executive branch, the parliament and judiciary still face many tasks to regain public trust. He also proposed joint efforts to achieve a mature level of democracy desired by the people. The president particularly called for National Assembly Speaker Moon Hee-sang's attention to economy and public livelihood-related bills pending at the assembly. He added that most of the government's key reform measures require parliamentary legislation. The meeting was attended by the assembly speaker, Prime Minister Lee Nak-yon, National Election Commission Chairman Kwon Soon-il, Constitutional Court Chief Justice Lee Jin-sung and Supreme Court Chief Justice Kim Meong-su.